Home 2017 December 16 Can suppressing information and knowledge hinder society in the way it progresses into the future? 1984 and Brave New World contain key attributes that define the way each society behaves. These attributes manifest throughout the way the government treats its people, and how people treat others with regard to societal standards. Brave New World depicts a society by which readily available information makes the minds of individuals less willing to comprehend emotion and knowledge. 1984 depicts a world and society by which all information is contrived, people are under constant surveillance, and absolute loyalty from citizens resides with Big Brother. Both novels exert ominous traits that describe a future which is inescapable, even if someone is independent with their thought and action from society, therefore, death or zombification results from the desperate clawing for independence. 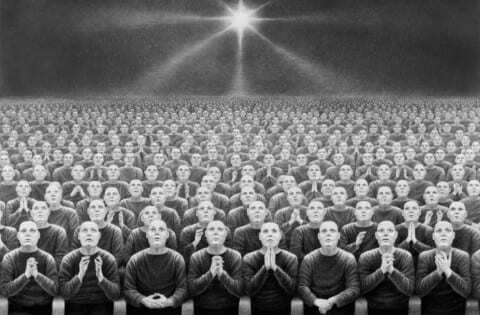 In Brave New World, the appearance of a conglomerated society which lives off the values of “Everyone lives for everyone” is made an example of zombification and emptiness that is subservient toward superior power. World Controllers monitor and control this superior power that lies in the blindness which fuels the everyday life of monotonous labor in a seemingly infinite caste system. Most everyone in Brave New World—except one of the main characters, the Savage—is created by science in incubator tubes. Science reached a point of Godlike capacity which made the arts and “Old Knowledge,” like Shakespeare, irrelevant. Without the wonder and inspiration to learn—the bases for combating boredom—people resort to drugs or soma, to keep them happy and ignorant along with the overemphasized permission to result in sexual interactions on a disturbingly frivolous scale. In addition to the drugs and frivolity, death in this story is a concept which correlates in indifference. Since everyone lives for everyone, death is viewed as a discarded importance long forgotten, just as the importance of “Old Knowledge” is discarded. One of the World Controllers sparks a conversation with the savage where he reveals the true nature of how people maintain unanimity in their ideals of life, “They’re well off; they’re safe; they’re never ill; they’re not afraid of death; they’re blissfully ignorant of passion and old age; they’re plagued with no mothers or fathers; they’ve got no wives, or children, or lovers to feel strongly about … And if anything should go wrong, there’s soma” (Huxley 220). The Savage, under much agony, after witnessing the horror of such an unsettling society, hangs himself. His desperation for an independent life resulted in the destruction of his own; “Only those moments count, when the desire to remain by yourself is so powerful that you’d prefer to blow your brains out than exchange a word with someone” – Emil M. Cioran. The unsurpassed claustrophobic world of Oceania in 1984, illustrates a society where information goes beyond the common suppressiveness of voice. Knowledge and ideas are fundamental operations in the human mind that are monitored and suppressed too. The voice of the public is suppressed and altered to a point where news is only complementary to the government and Big Brother. The main character, Winston, works for the government in a position where he rewrites articles and news publications so that the information he changes is in perspective of making his government look good. However, he becomes aware of the dishonest and flawed life he’s been living. He finds a notebook and begins to write in it about his life and his mental processes relating to the world around him. Unfortunately, he is terrified when he writes in this notebook in fear of him being arrested or killed by the Thought Police. The brutal force of the Thought Police is an aspect that defines the might of Big Brother along with the government’s persuasive power. These police will eliminate anyone with independent thought, especially in reaction to a possible threat to Big Brother. Winston becomes a thought criminal and one whose capacity for freedom and truth is hindered forever. He is beaten almost every day as his will and hope break down, his desire to pursue independent thought is diminished. “He seemed to have lost the power of intellectual effort, now that the stimulus of pain had been removed” (Orwell, 275). Winston, in the end, is beaten down to the point where his soul, body, and mind are in submission to the only source of power he has left, Big Brother. “ … everything was alright, the struggle was finished … He loved Big Brother” (Orwell, 298). Both Huxley’s novel and Orwell’s novel depict the tragedy and folly of societies that are controlled by those who rule with absolute power. As John F. Kennedy once said, “The men who create power make an indispensable contribution to the Nation’s greatness, but the men who question power make a contribution just as indispensable, especially when that questioning is disinterested, for they determine whether we use power or power uses us”. The contribution to Literature that these works bring contain truth by which power should not be used by those who hinder the independent minds of humankind. Can suppressing information and knowledge hinder society in the way it progresses into the future? by Judge Thomas is licensed under a Creative Commons Attribution-ShareAlike 4.0 International License. New GovernmentDo we trust the internet too much? This is very interesting, Thomas. I especially like what you said about the idea of zombification, and that a society where everyone works only for everyone else causes a society where there is no individualism. This hinders progress in any society. When reading your discussion, I immediately began to think of North Korea, and how “the regime has invested massive resources in trying to maintain an information blockade and keep its monopoly as the only source of information and ideas to the North Korean people” (https://www.libertyinnorthkorea.org/learn-nk-challenges/). The North Korean people have little to no access to information not given to them by their government, and this has caused a society depleted of not only resources but also free thought, which has caused them to fall behind most other countries in the world in terms of research and betterment of their country. I will look forward to your next discussion.